I was given an award by Debbie of DebbiesTinyTreasures & promised her that I’d add my 5 fave things & 5 fave blogs on here, but, true to form, I’ve forgotten exactly what I had to do & for some reason Debbie, I can’t get onto your blog! I blame my son-in-laws internet connection...it’s so very bizarre & just won’t let me access so many places...between that and the constant “dropping out”, which means unplugging the modem at least 25 times a day....I haven’t done it yet. BUT, here goes, now we’ll find out if I’m really as senile as I think I am, as I’ll try to remember just what I needed to do! 2) Actually managing to strike a clean, long & straight ball off the tee...now that one doesn’t happen very often! 3) Walking my 2 dogs along the beach, particularly when it’s deserted in the winter! 4) Breaking the sea-going “speed limit” in my boat...tut, tut....I think I’m still that rebellious schoolgirl..yeah, in my dreams!! 5) Eating pizzas freshly made in my very own wood burning pizza oven, built for me in the garden by my ever loving S-I-L(son-in-law) & even more loving hubby!!! They would taste better if we ever got some lovely sunny, DRY weather to actually use it properly...I don’t think it’s stopped raining or snowing since they built it last ?summer?. 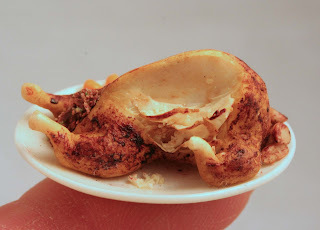 1) The Mini Food Blog as Sumaiya does a wonderful job & is wholly responsible for making me get into blogging! 3) Sassy’s Mini Dolls...just love the attitude those dolls take! 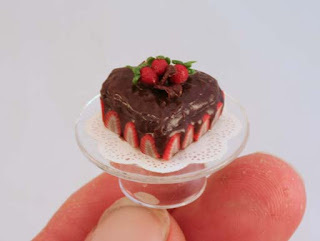 4) Miniatures by Rachel, her work is beautiful. 5) Petitplat by SK....Stephanie, your work is fab! Talking of pizzas..here are 2 minis...true “copies” (& my goodness there seems to be a whole lot being stirred up right now by a few artists who seem to have “lost it” with a copycatter...*sigh* ...there’s nothing anyone can do except hope that the copycat finally gives up!..life’s too short to worry about it guys!) of my own pizzas lovingly made for real & cooked in my pizza oven!! So YES, they ARE copies both of something “real” that I made & then ate & no doubt hundreds of other pizzas, either “real” or “miniature”...but they are all my own work for my friend Rosy! & now, a pizza Fiorentina, featuring the egg & spinach that are synonymous with the description “Fiorentina”!! 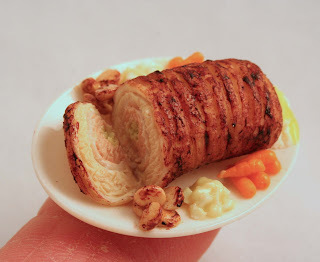 Now I’m hungry, which is why I just love making miniature replicas of the things I just LOVE to eat!! I must admit, I’d far rather be eating these in a little trattoria/pizzeria somewhere in Florence or Bassano del Grappa! A very strange lobster thermidor!! I have the most incorrigible sweet tooth! No matter how much I try to concentrate on making savoury pieces these days, I always seem to find myself making something sweet! This last few days it has been Danish pastries & croissants, thanks to a commission order for trays of them...& I was actually thinking that I might get a chance to make some fish & shellfish for a change...it seems so long since I’ve had a chance (or the urge) to make non-sweet goodies that I was really looking forward to making a mini lobster thermidor...one of my favourite dishes of all time! Then the commission order for pastries came in & as I’m away from my “mini sweatshop” again for 3 weeks..babysitting again...I really had no choice but to concentrate on getting the pastries done. At least I managed to put a little croissant prep board together which was fun to do & fill a basket with some of the left over pastries I’d made for the order. Guess what I just had to eat once I'd completed these...the most delicious, hot buttery croissant & I have to confess that the only way to eat them is to split them open while they are still hot & fill them with butter & golden syrup. I hate to think of the calories in a croissant the way I eat it!! I've had enough of the sweet stuff!! Having just completed a commission order for savoury pieces, I suddenly had an overwhelming urge to STOP creating sweet treats...only for the minute, I'm sure I'll get back to them... sooner, rather than later! !...& make some savoury foods. The trouble is with my minis that before I make a piece out of clay I have to make the "real" thing 1st as I always work from the "real" thing & of course I then have to eat it...can you imagine just how many inches have gone onto my waist & hips & just about everywhere else recently!! It had to stop! So....having come across an old recipe of my grandmothers for a lovely loin of pork rolled round sausagemeat & apple sauce, I decided to make it, not just for a family meal, but in miniature as well. The only trouble is that it was just so delicious that I managed to consume not only 2nds but 3rds of it, so I think I probably added more to my overall measurements that if I'd had plain old mince & a pud! There's obviously no hope for me. I think I'm just going to get fat & old even more disgracefully than I do now! Then I decided to carry on in the savoury mode, as I needed to write & photograph a tutorial for CDHM on making a carved chicken....guess what we had for dinner this evening in our house!! I'm not sure what I'm doing writing this as I'm rapidly running out of time now...I have to leave for my next 3 weeks away from home (& more importantly, my workshop) amongst charming nappies, school runs & spelling tests on Sunday & today is Wednesday....oh dear, sooo much to still get done. Looks like I'll be burnung the midnight oil....again!! At last I have been able to get into the workshop & actually make a start on some of the pieces that had to be put "on hold" while I was away babysitting....have I mentioned that I only have 14 days at home before my babysitting services are needed for another 3 weeks...Oh dear, I'm going to have to be burning the midnight oil in the "mini sweatshop" for the next week or so!! I'm getting off the subject though...I just had to vent my feelings about working with resin...horrible, sticky & non-removable stuff that it is! It seems to have a mind of it's own. No matter how careful I am when using it, I always end up with it all over my hands, where it stubbornly stays for hours, & whatever surface I happen to be using. Then, just when I think I've got it under control, the damn stuff refuses to set as quickly as I want it to! Whilst making this clam chowder set for a commission order I found myself still sitting at 2.00am waiting for the resin to set to just the correct consistency to allow me to balance the ladle in just the right place! I was so pleased to be done with the horribly sticky willful stuff, imagine how I felt when the customer requested a carafe & filled glasses of white wine to be added to the set......argh...more resin! I haven't quite plucked up the will to get it out again so in the picture the carafe & glasses are still empty! Back to the "mini sweatshop"! Well, here I am back at home after 4 weeks of changing nappies & the school run, up the hugest hill, twice a day! I had hoped to get into the workshop & satisfy my severe mini making withdrawal symptoms & take some pics of the pathetic 3 pieces I managed to create in 4 WHOLE weeks, but after sorting out my hens, dogs, unpacking & the husband (in that order!! LOL) the light has now gone & I'm ready to crash into a hot bath & bed! 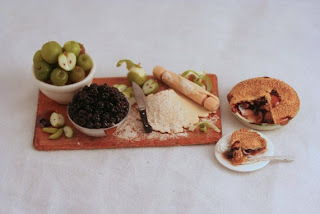 Rosanna reminded me of the gooseberry pie board, so I thought that at least I could upload a pic of that...& guess what, I managed to find one!! That, in turn, reminded me of a similar piece I made towards the end of last year, a blackberry & apple pie making board so here it is. A New Year's Resolution...A little late!! This was the one & only resolution I made to myself this January..I was definitely going to make the time to actually start on this blog! Well, after all we are only into February now & I have made a start, small though it may be! With having had my 3 young grandkids to look after for 4 weeks I've been getting severe min-making withdrawal symptoms...little fingers & miniature sculpting are NOT a good mix! This is a start though & hopefully I'll get some new work done soon to post up here....watch this space! I did manage to make this strawberry & chocolate heart gateau for Valentines day.. so there has been a little progress made!